The mining industry regularly deploys sophisticated analytical instruments to harsh environments. There is an increasing demand for on-site mining labs that provide a safe, efficient and ergonomic working environment. Additionally, the lab must be capable of providing a clean and controlled workspace suitable for complex analytical instruments. This is particularly challenging in remote settings with harsh conditions and severe climatic activity. Germfree Environmental Labs designs, engineers and manufactures advanced modular and mobile laboratories to serve the varied technical demands of the mining industry. Our modular units are ideal for laboratory space for new mines or to replace outdated lab space at existing sites. Additionally, our units are utilized to provide added capabilities or extra lab capacity. Our units provide monitoring environments, environmental labs for soil, water and air as well as assay labs in process sample spaces. These facilities are also ideal for allowing mining operations to acquire on-site data in remote locations. Germfree’s labs utilize advanced HVAC engineering and monitoring systems and are designed to operate in the most demanding environments. Environmental Enclosures: In addition to complete lab facilities, Germfree Environmental Labs provides environmental monitoring enclosures. These unmanned units provide stable temperature and humidity enclosures for critical analytical equipment utilized in mining labs. 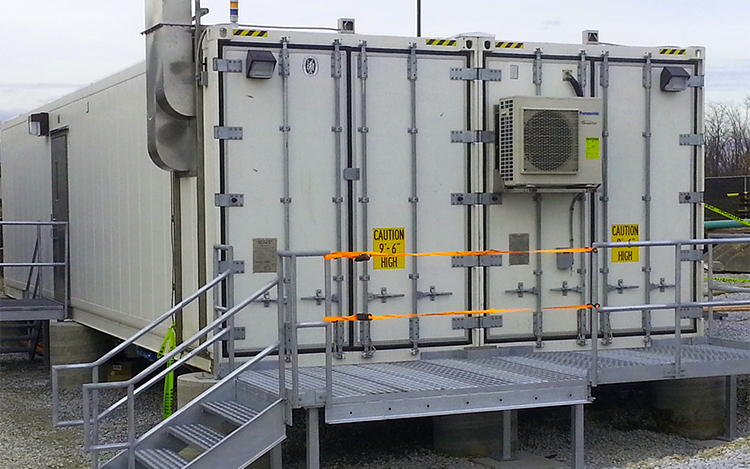 Our custom containerized modules are able to protect sensitive equipment and instruments in the harshest environments. Backup and redundant electrical power supplies are available. Our mining laboratories provide optimal on-site testing facilities for mineral and metallurgical operations. Germfree develops platforms for hydrometallurgy, exploration, sample preparation space, analytical labs and support labs. These units can provide the needed capabilities for projects ranging from coal testing operations to remote iron ore projects. Germfree’s mining laboratories differ from those constructed with traditional modular manufacturing techniques. We use all metal construction and monolithic floors, walls and ceilings. These materials enhance the durability and integrity of the facility and make these units ideal for rugged environments. Our engineers study your lab mission to provide comprehensive space planning. This insures an efficient workflow and the proper integration of analytical equipment. Additionally we assess your storage needs, data management/integration and safety requirements. Germfree labs are highly adaptable to any mining operation. Our units are built to last for long-term projects and can be easily relocated to the next site. Germfree’s engineering expertise ensures that the laboratory will meet all your rigorous requirements. Our Integrated Modular is a highly innovative approach that provides new laboratory space engineered to match the requirements of your existing facilities. All technical/laboratory areas are fabricated at Germfree and then shipped to your site. Our engineering team concurrently works with your facility managers to coordinate a final exterior building that allows uniformity with your existing structures. Additionally the technical/lab space is designed to easily integrate with non-technical areas, such as administrative and office space. Read more. Environmental Labs manufactures advanced analytical laboratories into the mobile platform of your choice. We offer Vans, Trucks, Trailers, and Mobile Container Labs to accommodate any requirements for your mining operations. Germfree’s Mobile Labs are deployed for a range of missions and are suitable for applications in the most demanding environments. Our ruggedized cabinetry insures that sensitive instruments can be deployed wherever they are needed. These advanced units enhance existing laboratory operations, add new capabilities and provide maximum flexibility for multiple mining sites.